Here's an incredibly easy DIY for all you lovely divas to try. It is quick, simple and a fantastic idea to up cycle old fabric pieces. So, if you've been following my blog for a while, do you remember my skirt from my cherry blossom post (or the Lavender post)…? Well, it wasn't really working for me. As in, the colour of the skirt is adorable but the length was bugging me a lot. It wasn't quite maxi (was above my ankle) and neither a midi. So I decided to alter it. Now, as my simple science tells me, it is possible to cut it short but not quite easy to do the opposite. So, I decided, "short it is!" And this is how it looks now. I'll be honest, the material is not quite my favourite. It creases a lot and greys easily. I'll have to sew the edge and iron it before wearing, but for now, it's all I have for a pretty pink skirt. 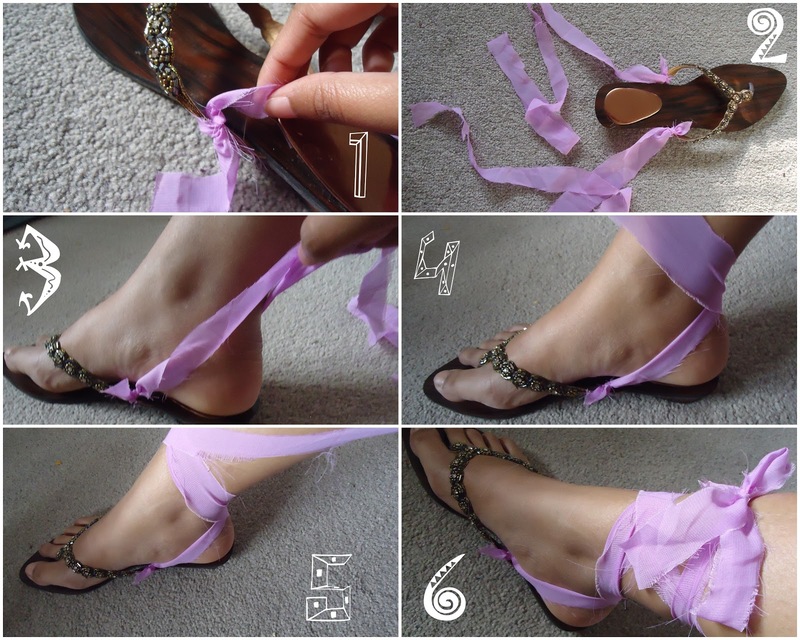 Anyway, this DIY is a simple tutorial to make your own tie-up sandals. I used the left over material from my skirt so please pardon the quality. Remember: this is just for the tutorial. I will not strut around in it in public I promise! Lol… No, honestly, I am actually using proper fabric, satin ribbons or pretty lace ribbons for the real project. This was just to give you a gist of how you can up cycle left over fabric, old scarfs, lace ribbons and other such craft pieces. Step 1: I cut out two strips of ribbons from my left over skirt material. Step 2: Then I cut the strips into two halves each. So, in total, now I have 4 strips of fabric. Then, taking two strips, I tied each end of the two strips to the two sides of the dandle around the base of the thong (pic 1 and 2). Step 3: Then one by one followed the steps from 3-6 on both legs to achieve my simple and easy tie-up gladiator sandal look. *Btw, why I suggested you use non-greying fabric is cause I guess you can clearly see from the pics how the fabric got worse and worse with each step of pulling and tugging from 1 to 6.